10 Sep 2007 (Vietnam Net Bridge) – A 1,500-year-old citadel is found in the Southern Ba Ria-Vung Tau Province, possible of Cham origin. Ba Ria-Vung Tau General Museum and the Institute of Social Sciences â€“ Southern Region have unearthed an ancient citadel dating back 1,400 to 1,600 years at Go Cat hamlet, Xuyen Moc district. Initial investigations reveal that the citadel is composed of two walls of laterite. The inner wall encloses an area of around 4 ha, and the outer one, 36 ha. The citadel was found buried 1 to 1.5 m underground. Other discoveries include terra cotta bowls and plates over a thousand years old. There is also a broken ceramic bowl dating back to the 16th century. According to doctor Dao Linh Con, director of the Archeological Research Centre under the Institute of Social Sciences â€“ Southern Region, this ancient citadel is the only one of its kind in the south with walls in quite original condition. 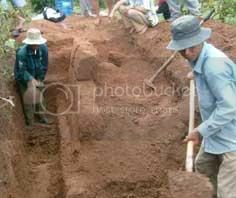 The institute and Ba Ria Vung Tau Museum will soon ask for permission to further excavate the area next year. Previous Post: Whose treasure is it anyway?